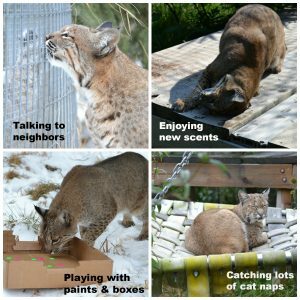 I’m so sad to share we helped 20-year-old bobcat Harley on to her new wild life. We could no longer keep her comfortable with the spread of carcinoma in her leg. So we had to make the difficult decision to let her go. We always use the phrase ‘wild at heart’ when talking about our residents, but these words truly embody who Harley was. Content at the Sanctuary, she always had a wild side and kept her distance from her caretaker humans. For years, she enjoyed their companionship. But as she aged, she wanted her own space and we gave it to her. She much preferred her habitat in the brush, watching wildlife in the woods nearby. She had her very own “bird tv” as she lounged on the fire hose hammock she loved. And though she enjoyed boxes, scents and other enrichment, she enjoyed it even more when no one was watching. She was camera shy, so we respected her privacy. Harley may have not rubbed and purred along the fence to us like other bobcats, but that didn’t mean we loved her any less. Love isn’t about reciprocation. It’s about loving selflessly and giving Harley the best life she wanted – on her own terms. And that’s exactly what everyone did. Harley, sadly you couldn’t live wild, but we were able to give you the next best thing – living wild at heart. Now you truly get to live as your spirit was meant to be. No more fences confine you. And every choice is yours. We will miss you each and every day, but smile knowing you are finally free. 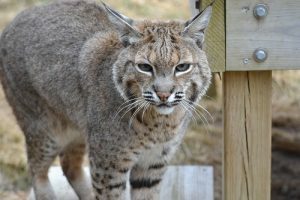 Harley is one of our oldest bobcats here at The Wildcat Sanctuary. 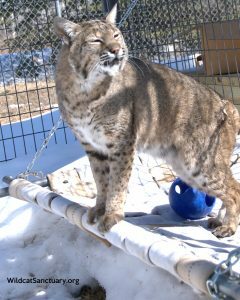 She came to us in 2010 along with Salem and Lakota, two other bobcats from Wild Animal Orphanage (WAO) in Texas. WAO was closing and, with over 400 animals to place, we knew we had to help. These three bobcats, along with several tigers, found a forever home at The Wildcat Sanctuary. 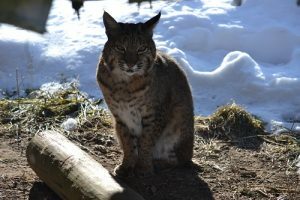 When the bobcats first arrived, they needed immediate veterinary care for a flea infestation and multiple types of parasites. 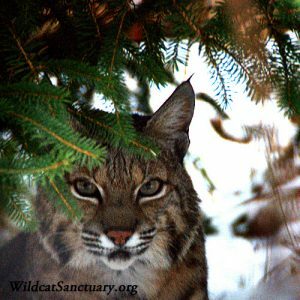 Ever since, Harley has been a very healthy bobcat. Harley, as her name might suggest, is a bit of a wild child. She is very vocal and loves to grumble while eating her meal. She has one of the most unique faces we’’ve ever seen on a bobcat, which only makes her much more special! She loves sun bathing in her hammock, rolling in catnip and perfumes, and showing off to her neighbors just how beautiful she really is. She is one sassy lady who just loves her TWS forever home! You can help provide daily care for Harley by sponsoring her today. Your support is greatly appreciated.